Felix Octavius Carr Darley (1822-1888), Study for Thinking of Home. . Charcoal and graphite. Graphic Arts Darley collection GC007. 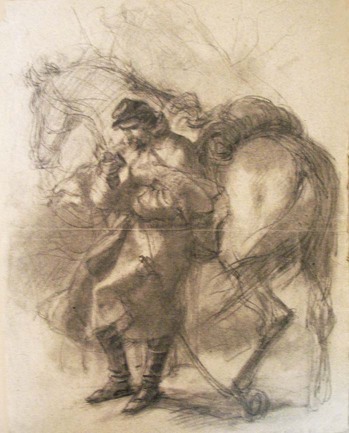 For many years this sketch of a Union soldier leaning against his horse, holding a miniature portrait in his right hand, has been held at Princeton unidentified except for the artist’s name. 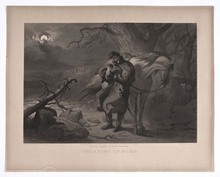 Happily, we now know it is a sketch for a scene mezzotinted by John Sartain in 1866, honoring the Civil War soldiers now returning home from war. There are many other unidentified sketches in the Darley collection and hopefully, this is only the beginning. This entry was posted in Archive, Google Reader and tagged Favourite, Google Reader, Graphic Arts on 27/02/2013 by John. Posted on February 26, 2013 at 02:25PM. This entry was posted in Archive, Tumblr and tagged @itscolossal, Favourite, Tumblr on 26/02/2013 by John. Posted on February 26, 2013 at 11:48AM. This entry was posted in Archive, Tumblr and tagged @warrenellis, Favourite, Tumblr on 26/02/2013 by John. Posted on February 26, 2013 at 11:58AM. This entry was posted in Archive, Tumblr and tagged bravecadet, Favourite, Tumblr on 26/02/2013 by John. Posted on February 26, 2013 at 12:00PM. This entry was posted in Archive, Tumblr and tagged Favourite, new-aesthetic, Tumblr on 26/02/2013 by John. This kimono sales catalogue was published by a fabric shop in Kyoto, just before it developed into a modern department store. Although there are no other records for the book in OCLC, the Japanese National Diet Library, or other similar databases, we have the editor’s seal and publisher’s seal listed on the colophon page to identify the volume. 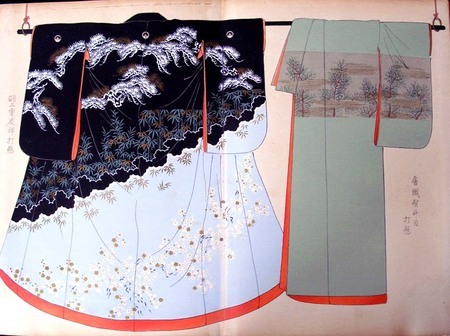 In 1717, Shimomura Hikoemon Shokei opened Daimoniya, a kimono fabric store in Fushimi, Kyoto. Later moved to Osaka, the store’s motto was “service before profit.” In the twentieth century, they opened a modern department store in its present Kyoto location and in 1928, changed the name to Kabushiki Kaisha Daimaru. A history of Daimaru has been posted at: http://www.j-front-retailing.com/ir/annual_report/jfrnowe36.pdf. This entry was posted in Archive, Google Reader and tagged Favourite, Google Reader, Graphic Arts on 26/02/2013 by John. Posted on February 26, 2013 at 02:54AM. This entry was posted in Archive, Tumblr and tagged Favourite, jtotheizzoe, Tumblr on 26/02/2013 by John. Posted on February 25, 2013 at 11:00AM. This entry was posted in Archive, Tumblr and tagged Favourite, livelymorgue, Tumblr on 25/02/2013 by John. Posted on February 25, 2013 at 11:16AM. This entry was posted in Archive, Tumblr and tagged @warrenellis, Favourite, Tumblr on 25/02/2013 by John. Posted on February 25, 2013 at 11:40AM. This entry was posted in Archive, Tumblr and tagged Favourite, stilllifequickheart, Tumblr on 25/02/2013 by John.